The next day Tria woke up and rubbed her eyes. She hardly remembered what she did last night until she started thinking about it when she was eating her breakfast. After that, she went to School. She was assigned a couple pages of language homework, but she didn’t mind. She also got 5 pages of history. Then she had to write and essay before the end of the week (It was Tuesday) and the essay was on her least favorite subject: science. She didn’t know why she really had to learn all his. Does she really need to know all this stuff about molecules and atoms if she can’t even see them with her eyes? Tria was not planning on being an Einstein anyway, and someone already invented the things that come into her mind. Chloe was a type of smart person. She spent most her breaks in the library or sometimes outside to gather information. She had already finished the homework at the end of the day, so she asked for some more language for home. Tria didn’t walk home with Chloe today. Chloe was probably already home, doing extra work when Tria was still walking home. When she passed by the ‘shortcut’ that she and Chloe had gone down last time, she stopped. Someone went out and when they opened the door, Tria could hear Tepo’s loud voice booming out. “I guess I could just do my homework there…” thought Tria. It wasn’t a bad idea. Tepo turned to the man. “Well, Pal, maybe you should get some glasses!” Tepo said. “I know your wife Linn has been bothering you about it!” Tepo then straightened his glasses and happily walked back behind the counter. Every time they laughed, the rusty metal cups on the shelves made tinking noises. The spice jars and oil bottles were so dusty and grimy, that they looked like they hadn’t been used in ages. “Or maybe they really hadn’t been,” Tria thought. When she was finally done her homework, she went home. Thinking that she might come back tomorrow. 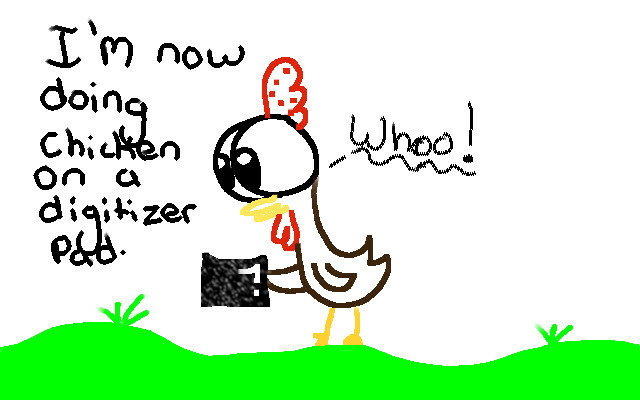 I am now doing chicken on a digitizer. I hope you like the new style! It was September 21st and 12-year-old Tria was walking home with her friend Chloe after school. They were street neighbours so they could easily walk to each other's houses. “So, uh Chloe?” Tria asked. “I guess, kind of,” Chloe replied. They both had very straight, dirty blond hair that were both around the height of their shoulders. They had a big difference in the face though. They also wore different style clothing. They were best friends and sometimes they would walk in the same strides. “Sure!” Tria said. “I might want to stop off at the coffee shop on the corner. I’ve never been there.” So, Chloe passed by and then ran to her house. Tria stayed there, lurking around for a few minutes before entering the cafe. It had green peeling paint on the wood, and old fashioned, dirty windows. A big brown sign on it read All3yway and the light in front of the door was flickering. Was it a good idea to go here instead of following Chloe? Well, it was too late to think it over too much. Tria stepped in, a little windchime was on the door so it tinkled when she entered. Most of the faces looked up to her. They were mostly old men, men with poorly shaved beards, and women with big, long brimmed hats that covered their eyes. Tria stepped up to the counter and looked at the menu. It was a piece of wood hanging by metal chains, but the words carved in it, were not very readable. “Could I get a hot chocolate?” Tria asked. “N-no sir,” Tria stuttered. “The words aren’t very readable.” There was a soft laughter through the cafe, which was more like a bar. Denn nodded. Does Tepo greet every single customer like this? Maybe they just don’t get many customers. A couple left. “Bye Kara and Garry!” Denn called after them. Well, he knows the name of his customers. “I’m-u Tria,” Tria said, managing a smile and shaking Tepo’s rough hand. “What will you be having today?” he asked. “I better get going actually!” Tria said, quickly. She left and went home. It was just in time. Her mom walked in the door a few minutes after her. I am soo sorry this Christmas post is late! Brandon walked into his bedroom carrying a remote control airplane, a bag of chocolate cookies, and a Vancouver Island model. Those were his Christmas presents. He looked at a little coin on his bedside table and sighed. It had been three months since his third visit to Magi-Land and he thought he might want to go again. He planned to go the next day when he could bring all he needed. “Brandon!” Jan said happily when he saw Brandon. Brandon’s arms were full of presents and cards. Brandon handed Jan a card. “Oh, thanks so much!” Jan exclaimed. Brandon nodded happily at him. Brandon walked to the new train station. A few floating metal platforms glided into a tunnel. Brandon stepped onto one, sitting down on a glowing blue bench. The train whizzed through the glass tube, all the scenery outside getting blurry. Now that Brandon wasn’t a newcomer, the ground was green and the sky was blue again. Grassland the voice of the train said as it came to a slow halt. Brandon climbed out. No one followed him. The train seemed to be empty that day. “Merry Christmas!” Brandon shouted, handing Oaky and Oaka each a Christmas themed watering can and some wrapped shovels so they could shovel snow off their branches. “Yeah, and happy Christmas to you too,” Oaky smiled. “Bye” Brandon stumbled off away, to the field where S.O.M.L. was. “Gobb?” Brandon yelled at a chair like stone in the snow that seemed to be sleeping. “I’m awake! I’m awake!” Gobb scolded. “No need to yell!” Gobb opened his eyes and his face brightened when he saw Brandon. “Oh! Brandon, Merry Christmas! I wanted to shake your hand but my arms are very... sharp. Well, sit down.” Brandon smiled and sat down. “Happy to give, my friend,” Brandon laughed and handed some sugar apples out to workers. After he had taken a pile of apples off his load, he spotted Hal. “Oh, Hal!” Brandon exclaimed. “Yeah, you’re working here now! I forgot.” Brandon handed Hal another ticket for Wizarding Soccer. “Oh, that’s great Hal!” Brandon said. “But, I need to get going to give everyone else Their treats.” Gobb, Hal and Brandon all bade each other farewell and hoped to see one another soon. Brandon started across the plain to Blair’s tower. Now, he had only Blair and Giantray’s gifts to give. He walked down the hallway of Blair’s castle. One of the doors were open, but instead of it showing the open air, there was a quite spacious room that looked a lot like a bedroom with a ceiling fan on top. Giantray was sitting on her bed reading a book about horses. Brandon bowed and handed her a wrapped box. “Brandon this is beautiful!” the queen said, opening the box to a shimmering crown made of candy. “And merry Christmas, I have something for you.” She dropped a little folder into Brandon’s hands. Inside it were peppermint scented Christmas stickers. “Wow, thank you, your highness,” Brandon said politely. “Oh, call me Giantray,” Giantray smirked. Brandon bowed as he left the room. The door at the end of the hallway was closed. Brandon wondered if he should open it, he might disturb Blair. Eh, Brandon thought. He was going to give Blair a gift anyway. He slowly creaked the big door open. There he found Blair humming and sipping his tea. The dazzling gold room was decorated in a jolly way with red and green lights flashing. Brandon felt a whirl of light and then he was sitting on his bed, just where he left a few hours ago, or was it only seconds in this world?